Does the term "Chinese spirit" embody patriotism, reform and innovation? That was one of the topics for a translation workshop held in Beijing in December 2015. Karen S. Kingsbury was wrestling with fellow elite translators from China, the United States, Britain and Mexico about the exact meaning of the Chinese phrase -- zhongguo jingshen at the meeting. The results are still inconclusive. The workshop, jointly hosted by the China International Publishing Group and the China Academy of Translation, aimed to tackle some of the most difficult problems in the translation of Chinese literary as well as non-literary works into English. Given the vast differences between the two languages and the cultures that they reflect, participants underlined the need to adopt a narrative style that makes these works more accessible to international readers. Kingsbury is a key literary translator focusing on the eminent Chinese female writer Eileen Chang (1920-95). She is currently working on a critical biography of Chang to add to her other publications of the author, which include "Love in a Fallen City" and "Half a Lifelong Romance." She is also a professor teaching courses in Asian studies and world literature at Pittsburgh's Chatham University. Kingsbury lived in Chongqing, a metropolis in southwest China, from 1983 to 1984 soon after she graduated from college. The experience was so transformative that Kingsbury could not forget China even after she went back home. As an English major, she decided to pursue further studies in Chinese literature and look for excellent Chinese literary voices that she could turn into English. 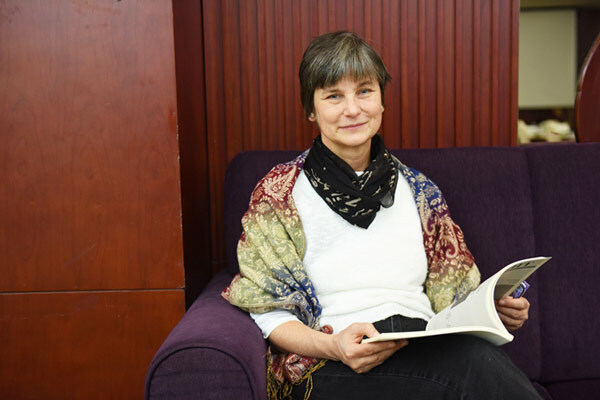 She believes that the translation of literature is a way in which minds can be connected across international borders, laying the foundation for wider communication between China and the United States. Influenced by her teacher C. T. Hsia, a renowned Chinese literary critic at Columbia University, Kingsbury has an academic inclination to China's modern writers, particularly Chang. When first reading "Love in a Fallen City" in 1990, Kingsbury, having poor Chinese at that time, had a kind of spiritual experience. "I could feel for the story even when I was struggling with the language," Kingsbury recalled. She believes that the literary piece has the power to draw people into it, even if they may encounter language barriers. "I wanted to read Eileen Chang so much that I was determined to learn more Chinese," Kingsbury said. Her translation of the novella was first published in Hong Kong in 1996, one year after Chang passed away. Kingsbury published a collection of Chang's works under the same title in 2007, including "Sealed Off," her debut translation.